Last week saw arguably the worst weather conditions so far this year, but that didn’t stop the most recent England Ladies team hosting their annual assessment day on the Stainforth and Keadby canal at Thorne ahead of next year’s World Championships. Taking part amongst the field was Maver’s very own Emma Pickering, who took the overall top spot on the day to do her chances of being selected for next year’s England team no harm at all. “On Sunday it was the England Ladies Assessment Day on the Stainforth and Keadby canal which runs through Thorne. These days are organised by the team manager Dave Brooks to enable him to pick the strongest team possible to represent our country in the upcoming World Championships. The current squad of 6 attend, along with any new up and coming anglers that wish to be considered for a place. The whole agenda of these days is to assess the abilities of everyone involved and to see what we need to work on going forward to make this team a tight gold medal unit“. “In total 9 attended on the day and to say the conditions were extremely cold and uncomfortable would be an understatement, yet this didn’t prevent everyone digging deep and catching a few fish“. “I’ve been placed on peg 227 and I’ve decided to fish 2 lines and alternated between the 2 all day to keep picking fish off. Ive fished 8m and 13m with 50/50 groundbait and soil, with joker as my chosen bait. I’ve fed quite positively at the start with two lines so I could alternate between the two. I had one line at 8m and one at 13 metres rich with joker so I could move onto this line later in the day. I do this so it allows the fish to come over the bait and have the confidence to stay in the peg“. “My chosen elastics for the day were the new dual core Pro 3-5, which was perfect for the day as the plan was to catch small fish, but had I hooked a better stamp the versatility in the elastic would have given me a chance of getting a better fish in the net, and a signature series 5 float in 0.8 and 1g to an 0.8 and a size 20 hook“. 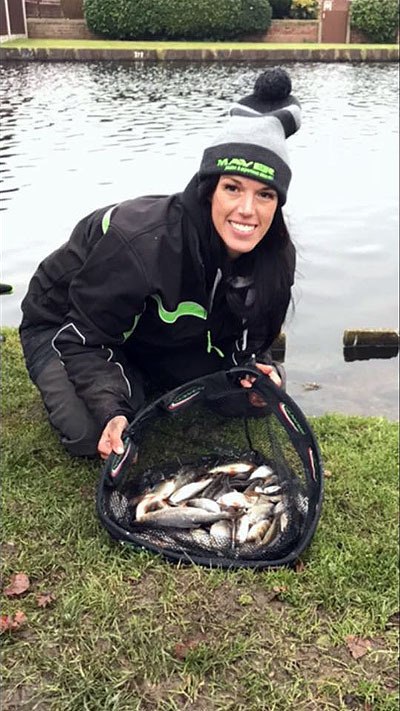 “We fished a four hour match as we do in a world event and come the final whistle I have ended up with 80 fish which consisted of mainly small roach and a couple of tiny skimmers and perch. These tipped the scales to 6lb 10oz, which was enough to be the top weight on the day“. “There were 3 young anglers on the bank who I have to say did extremely well and should be really proud of themselves as it is not easy for them to step up and compete along side the standing national team“. “Next years World Championship will be held in Poland and the team will be selected in due course, so fingers crossed I will be selected. The pride it brings to represent your country is next to none and still to this day can’t quite be explained“.